December 18, 2012 — I was in a pleasant harborside park on the southern tip of the main peninsula of Charleston, South Carolina, at the intersection of Southern charm and salt air. I was walking with my wife beneath a grove of massive live oaks dripping hermit beards of Spanish moss from their serpentine branches. It would have been romantic, but all I could think about were dead bodies hanging from those staunch tree limbs and slurping their way inland from briny graves in the harbor. All because of what was inscribed on a nearby stone. It’s something I’d expect to read on the welcome mat of a naval prison. Or fast-forward through on some menacing-looking screen at the beginning of a DVD. Or mishear in the bedrooms of dirty wenches in the shantiest of sea towns. 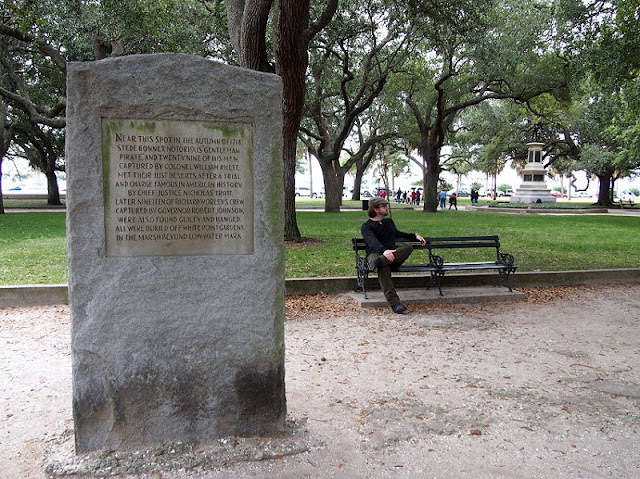 But that’s what it says on the tall, thin, rough granite monument in Charleston’s elegant White Point Garden. 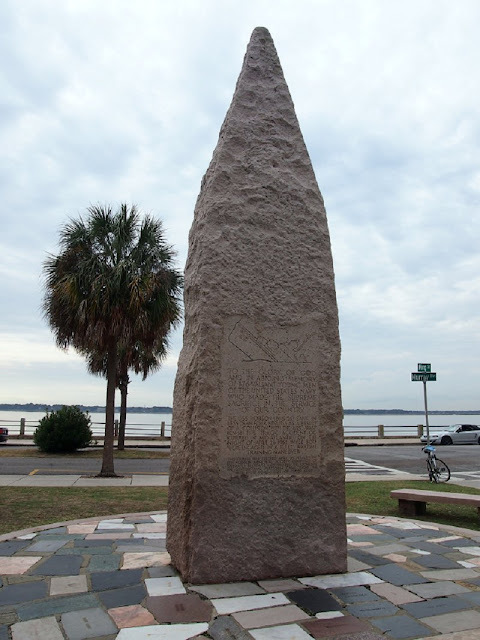 White Point Garden is a six-acre park that overlooks the harbor and three historic forts: Moultrie, Sumter, and Johnson. 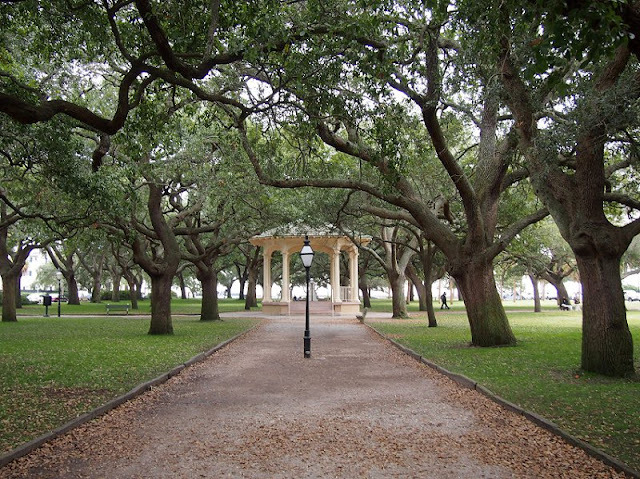 The park’s most notable feature is the aforementioned rows of live oaks (so called because they never lose their foliage). 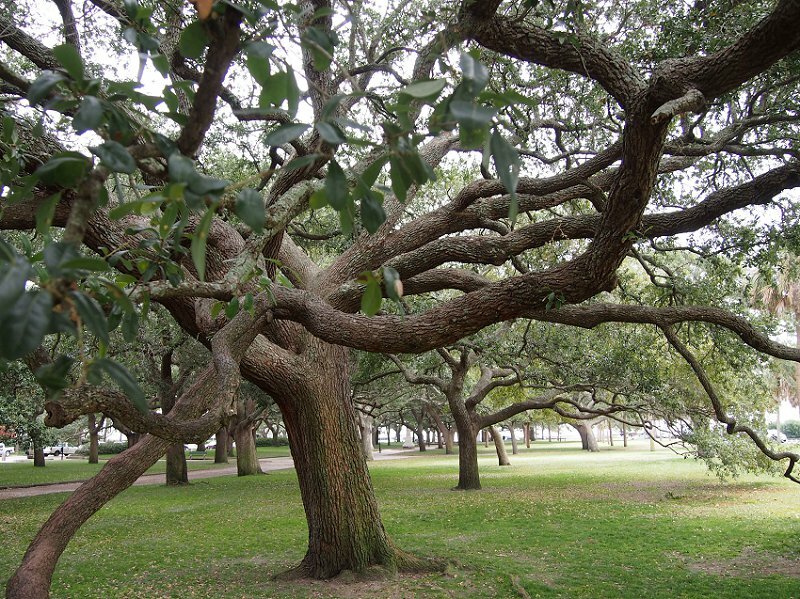 Their branches are so long and wending that the trees almost look upside down, their stretching limbs like gigantic root systems exulting in the ocean breeze. This picture is worth 71 words. Stede Bonnet was known as the Gentleman Pirate because he was a wealthy sugar plantation owner in Barbados and not at all a seaman. In fact, his strange exploits really should have gotten him his own sit com—called The Gentleman Pirate, naturally. 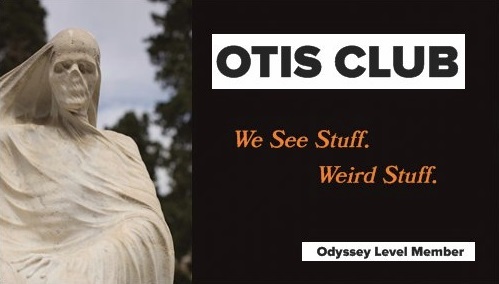 Theme song by Jesse Frederick. The pilot episode took place in 1717, when the thirty-something retired British army major decided to become a pirate. Because they hadn’t yet invented the Ferrari. The lore says that he was having marital problems, which he dealt with by going out and buying a ship and hiring a crew of experienced brigands like it was some kind of respectable business venture. He gave it the traditional pirate name of the Revenge, and I’m assuming he wore a fake eye patch. He had some early success thanks to his crew, but it soon became apparent that the guy was kind of the SpongeBob version of a pirate captain. 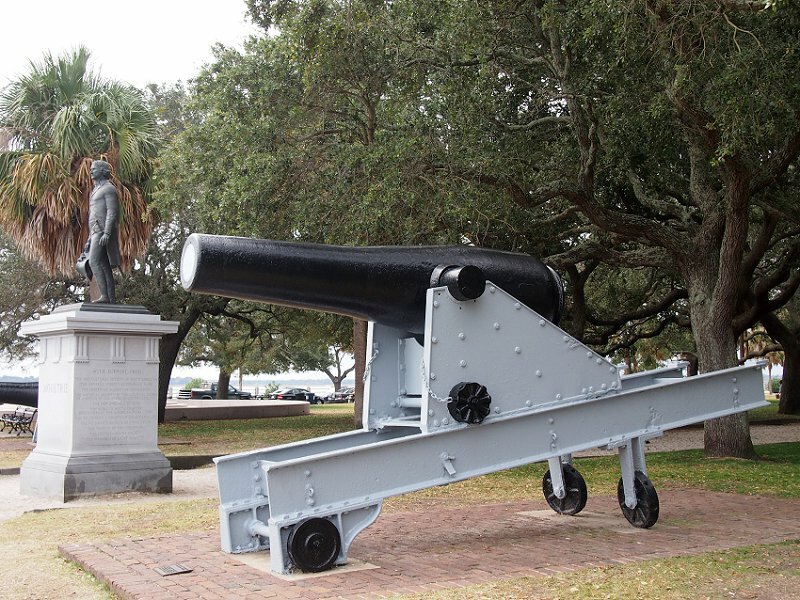 He became famous for tossing in his lot with old Blackbeard, and was a part of Blackbeard’s infamous siege of South Carolina. Blackbeard enthusiastically added the Revenge to his fleet, assigned it a more capable captain, and then kept Bonnet around as a “guest” on his own ship, the Queen Anne’s Revenge, where I assume hijinks happened episodically. At one point, while Bonnet was ashore in North Carolina, Blackbeard scuttled Bonnet’s old ship and marooned the crew. Bonnet was able to become a captain again by recovering it and rescuing them. But it was during repairs of what he had rechristened the Royal James in a bid to be a sanctioned (and pardoned) privateer against the Spanish, that South Carolina caught up to him. He and his crew were in the Cape Fear River, when Colonel William Rhett, acting on behalf of the governor of South Carolina, spotted them. 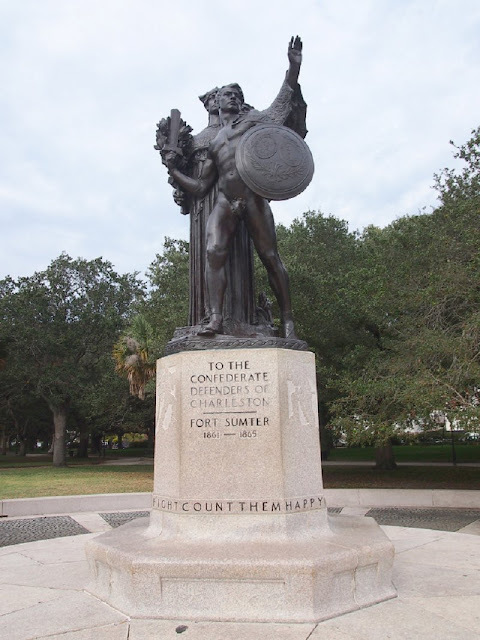 In August of 1718, they fought and he and his crew were captured by Rhett’s larger complement. On December 10, 1718, his short pirate career ended at the end of a short noose somewhere the area of White Point Garden, along with some 29 of his crew. 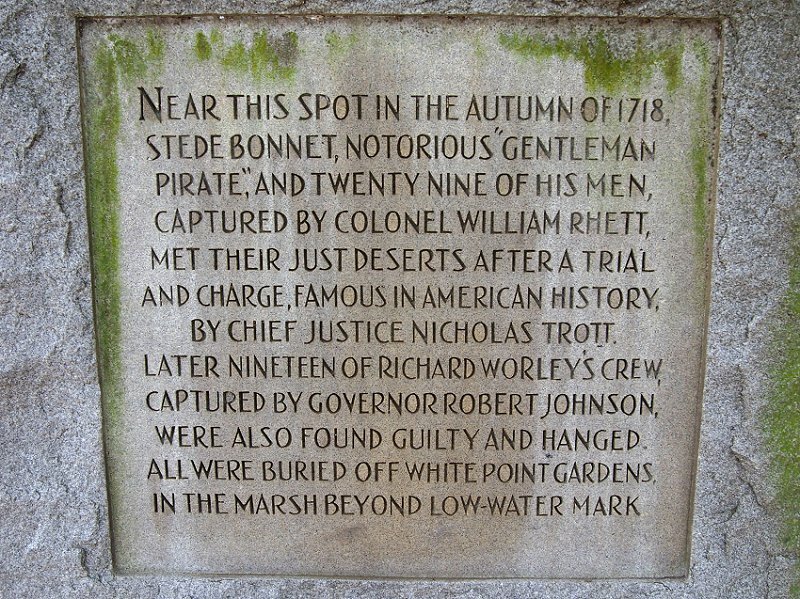 According to the memorial, the pirate Robert Morley would follow in Bonnet’s dangling footsteps at the same spot with 19 of his crew. The bodies of all 50 of those pirates were tossed out into the harbor. And while I kept imagining their limp corpses hanging from the copses, they were actually strung up in mass from a temporary gallows like morbid garland. They still might sop out of the harbor on certain moon-lit nights, though. 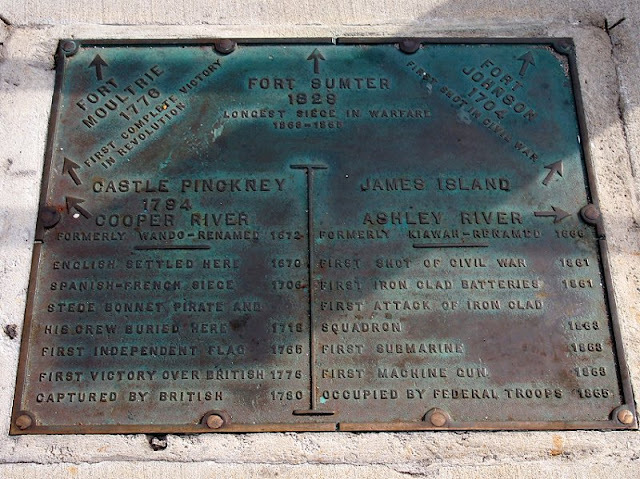 The pirate marker is on the side of the park that parallels South Battery Street, across from a line of opulent mansions owned by rich people who are probably never tempted to go out and plunder anything but the economy. All in all, the White Point Garden is a unique place that can be both a nice spot and a morbid one, the kind of place you could both tie a wedding knot or a hangman’s noose.